- Full directions on the back of the bottle with the above logo printed on the front. - Lubes tuning machine knobs and posts and strap locks. 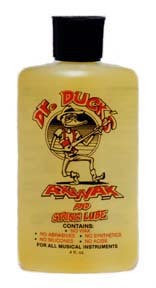 - This is the safest musical instrument cleaning-polishing-moisturizing formula in the World!! - VERY FRIENDLY to delicate VINTAGE finishes as well as all modern instruments.